This was one of my best races all year for so many reasons. I signed up for this race when my best friend decided she wanted to run a half marathon. To this day I don’t know why she picked this race. She doesn’t live in Wisconsin and there are lots of half marathons in DC that I fly back for. It does not matter. I got to help her train for this race even from afar. As I wrote on Friday I got to vacillate between Coach Renee and Friend Renee. This past week I tried to calm her. I almost forgot I was racing too. The Tyranena Brewery is in Lake Mills, WI which is about 30 minutes from my parents house so we stayed there on Friday night. This was not a typical race. We woke up around 7:15 or so and got to just enjoy the morning. The race didn’t start until 11:30! Getting there was super easy. I am pretty sure Thai Phi was freaking out at this point. It was a really easy packet pick-up. I found Sara. We all huddled in the heated tent for a bit. It is November in Wisconsin after all. They started trying to send us outside about 20 minutes before the start. We waited a bit longer. Once Sara, Thai Phi and I went outside we decided the weather wasn’t so bad. It had warmed up (almost 50) and was sunny. We wandered towards the back, found Marty and his sister, chatted a bit and the gun went off. My last words to Thai Phi were to go out slow and have fun. Sara and I set out at a pretty stead pace. Both of us were happy with the first mile, not too fast, not too slow. This was a beautiful course. Sara and I chatted some and just ran some. The first real hill was between mile 3 and 4. It wasn’t terrible, but it was not fun either. Both of us said something about quads as we got to the top. We caught our breath and kept trucking along. The next hill came pretty quick. This one was longer, but I didn’t think as steep. Honestly I didn’t think there were any more big hills. There were rolling hills, but nothing that killed us. Sara and I just kept on running. She would check in on me to see how much shin was. I checked in on her to see how her hips were. Around mile 10 we had the wind at our backs which was awesome, but then there was a turn around and we had to run straight into the wind. Good thing we had run in the insane wind just the week before. The last few miles were the most boring and least scenic, but at that point we both had done the math and knew we would get our sub 2 for the day. The finish was a ton of fun. We didn’t really talk about it and both had a big kick into the finish. I saw my parents right before the finish. And then my brother, his friend and the dog were right past the finish line. We crossed in tandem and then shared a huge hug. Running with Sara was so much fun! 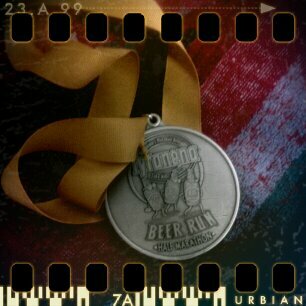 We got out awesome medals, found some food and then Sara went to find her family and I tried to find mine. It was a little crazy at the finish line tent, but I found the family. I really wanted to change my shoes and get my compression socks on. I thought I had enough time to do this and get back out to the finish to see Thai Phi finish, but she was so speedy I missed her! 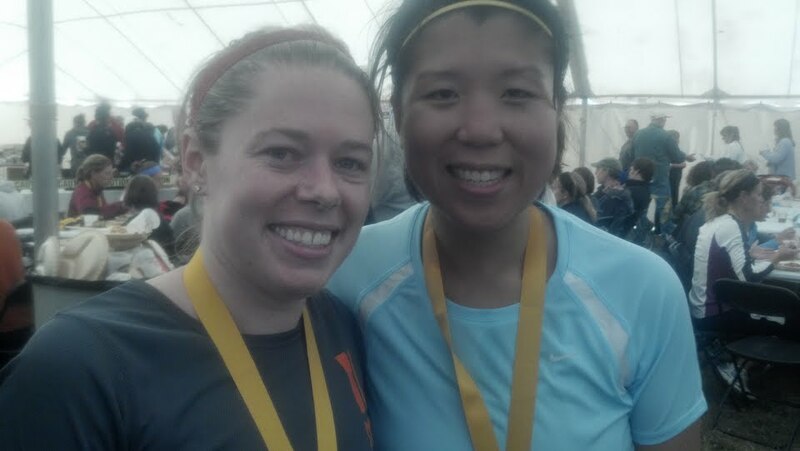 Thai Phi ran an awesome first half marathon and I am so proud of her. Sharing the day with TP. Sub 2! Congratulations! You got a perfect day for racing, yesterday was gorgeous! I wanted to do the Tyranena but it filled up! Oh well, maybe next year! I love the fact that it starts at 11:30.